Included with this deluxe reissue is a striking six-panel booklet complete with rare photos, a 3,400-word essay by Chris Hall on the album and a 1,200-word essay by Michael Fremer about the remastering process. This truly is a no-expenses-spared project, resulting in the ultimate version of this title. 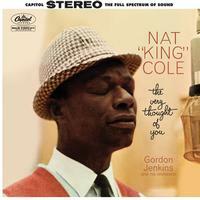 Nat "King" Cole and arranger Gordon Jenkins followed their hit album Love Is The Thing with The Very Thought Of You, foraging further into romantic and sensual bliss and creating the audio equivalent of a distillation of romantic ardor in a bottle. The sixteen ballads of The Very Thought Of You, each with their own euphoric tinge, include the title track "The Very Thought of You," "For All We Know," "Paradise," and "But Beautiful." Again orchestrated with the heavenly strings of the distinctive Gordon Jenkins, sympathetically backing the intimately expressive and supremely musical voice of the incomparable Nat "King" Cole, the result again stands among its era's finest, most stylistically defining recordings of popular music and continues to enchant listeners to this day. Using the original 3-track session tapes from Capitol's vaults and all-analogue systems including custom headstacks, 3-track preview heads, console and monitoring chain installed at AcousTech specially for these releases, mastering engineers Kevin Gray and Steve Hoffman realize the stunning wide-range potential and beauty of these recordings. Original releases contained 14 tracks, omitting two superb tracks recorded for the album, "Don't Blame Me" and "There Is No Greater Love," due to space constraints, but the full 16 tracks are included in this double 45-RPM 180-gram album set. Included with this deluxe reissue is a striking six-panel booklet complete with rare photos, a 3,400-word essay by Chris Hall on the album and a 1,200-word essay by Michael Fremer about the remastering process. This truly is a no-expenses-spared project, resulting in the ultimate version of this title and a historic reissue. One of my favorites, beautiful sound. But record jacket is of poor quality, flimsy and blurry cover art. Some say it's only the sound that matters but I think it's a shame they went cheap on the packaging.